After writing up a post on “Becoming An ESXi Direct Console User Interface (DCUI) Ninja“, I wanted to follow up with some content that revolves around the ESXi Shell. The details outlined here are meant to serve as a good stepping off point for those who are a curious as to what the ESXi Shell can do, especially for those intimidated by CLI or “Linux like” commands. While the hope is that you never really have to jump onto the ESXi Shell – typically, this means something has gone wrong – it’s good to have a comfort level and familiarity with how to navigate around in the shell. Additionally, there are still a hefty number of actions that require using the shell in one way or another, either directly on the console of your host, or via vCLI or the vSphere Management Assistant (vMA). The first step is to access the ESXi Shell. There are a few ways to accomplish this. 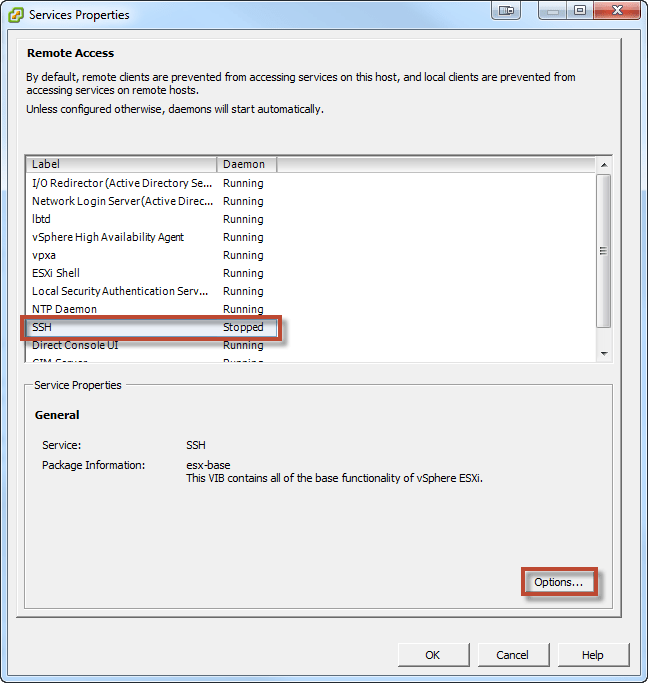 If the network to the host is not operational, you’ll have to use the Direct Console User Interface (DCUI) to enable the ESXi Shell (see the previous post in this series for details). However, if the host is available on the network, you can switch over to SSH. The easiest way to do this is simply start the service on the host. From there, select the SSH service and click the “Options…” button. Finally, click the “Start” button to start the daemon. Reaching the ESXi Shell from the DCUI is simple. Once the ESXi Shell is enabled, Press Alt + F1 to reach the ESXi Shell window. To switch back to the DCUI, Press Alt + F2. Now that you have access to the shell, let’s go over some of the commands I feel you should know without hesitation to get the job done. I see the last several lines of the log. This helps when you are troubleshooting an issue that happened recently. A really cool arguement for the tail command is -f (follow). This will actively follow the newly written lines and present them on the screen. If you just need to dump the contents of a log to your screen, use the cat command. This will then let you scroll up (Shift + PageUP) and down (Shift + PageDOWN) to find what you need. If you have a huge log or are looking for a specific event, I recommend the grep command. I often pipe (output) my tail or cat command into a grep command, which then searches the results for a string that I am looking for. In this command below, I first tail the hostd.log to get the last few lines, and then I pipe the results into grep with a search for the word Power. The -i argument ignores case, so that it will search for any variation of the word Power. 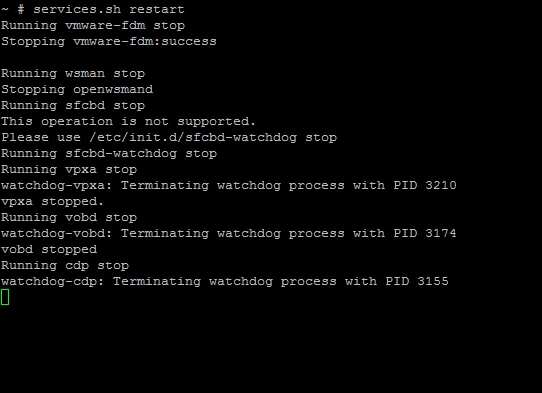 The esxcfg- commands are an assortment of tools that are VMware specific. Ranging from managing the nics, vswitches, and vmkernel ports, esxcfg- commands are the bread and butter of an ESXi Shell experience. Take note that these are slowly being phased out in favor of the new esxcli commands, but are still available and offer some features that are not yet available with esxcli. The final tools of a Ninja that I will cover involve the newest kid on the block: esxcli. Introduced with vSphere 5, this new command is an attempt to organize host management underneath a logical syntax. Instead of having to memorize a lot of root commands with esxcfg- , you now just start with esxcli and begin branching out. These are just a small handful of very simple yet powerful commands that are available to you. There are literally hundreds of commands and variations at your disposal, but I selected the ones above because I use them so often. Do you have a handy, often used ESXi Shell command that you want to share? Feel free to put the command or link to an article / post you’ve written describing one! Nice post. On the cat command I suggest to less command instead or pipe the output to less. It will allow you to navigate through the log file using the arrow keys from your keyboard. The Shift+PageDown Shift+PageUp tip is useful in a SSH session from Putty or a Linux box (in fact is a Bash feature) but it will not work in a ESXi Shell DCUI session, from the iLO or iDRAC of the server for example. Again nice work, and hope you like my posts. Very cool, thanks for the links to your resources! Very helpful and informative comment. Thank you. I have to disagree with your use of “ninja” in the title, sir. No reference was made to commands to stop/start/list VMs.